If you have SL aviation links for next weeks Virtual Aviation Week in Review, please let me know via email [zoeconnolly (at) gmail (dot) com. 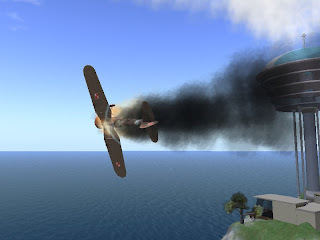 Terra Aeronautics - Virtual vehicles for the metaverse: "Server update breaks skydiving pods"
AngryMarineJf wrote: "Images of the Freespace's game mod "Battlestar Galactica beyond the red line...."
Guests Chrome Underwood, Bancos Milestone and Slim Warrior. 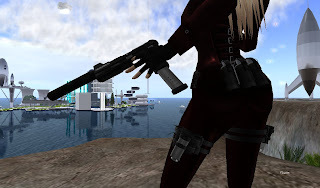 My new Ning.com group Virtual Girls with Guns is for girls who love weaponry, and the men and women who love them. 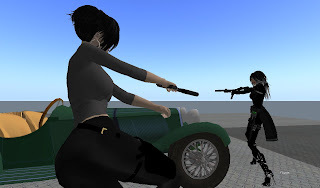 Virtual world women in Second Life®, their friends, loved ones and vast arsenals. 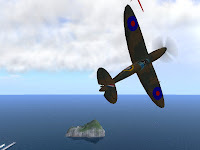 Scheduled EDF and RCAF Air Combat on Saturday 30 August at 9:00 AM SL time, then another dogfight on Sun 31 August at 9 AM SL time. From the Wiki: "The Piper J-3 Cub is a small, simple, light aircraft that was built between 1937 and 1947 by Piper Aircraft. With tandem (fore and aft) seating, it was intended for flight training but became one of the most popular and best-known light aircraft of all time. The Cub's simplicity, affordability and popularity invokes comparisons to the Ford Model T automobile. Its standard yellow paint has come to be known as “Cub Yellow” or "Lock Haven Yellow...."
I've gathered a few links to aviation related blog posts, videos, and photographs from the past week August 17 - 23, 2008. This is a new blog post series, so some links may fall outside my stated calendar week. 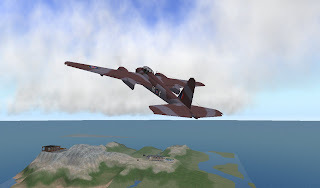 Scheduled EDF and RCAF Air Combat on Saturday 23 August at 9:00 AM SL time, with another dogfight on Sun 24 August at 9 AM SL time. 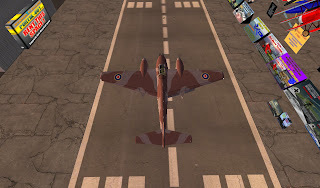 Josh Noonan released his SL version of the Sukhoi SU-26 and SU-29 on August 22nd. 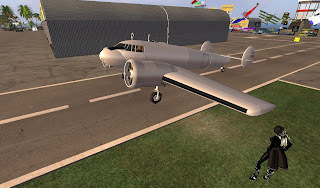 Annabelle Fanshaw's experience at Balsa Airport and Aviation Community in Aveousa. In-cockpit video of the EDF-RCAF Air Combat on August 16th. 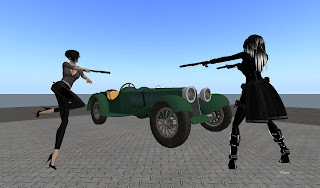 For vehicle builders there's "How to Texture in SL Like a Pro: Part 1"
From Hamlet Au's New World Notes blog: *Galactica* Roleplaying In Second Life With Physics-Enabled Dogfights And Planetary Combat. SL Aviation photograph of the week from Eladrienne Laval. If you have SL aviation links for next weeks Virtual Aviation Week in Review, please let me know via email [zoeconnolly (at) gmail (dot) com. Clear skies all! Kelvington wrote: "Well here is my little parody of Buck Rogers in the 25th Century, using Scotty of Star Trek fame from the Next Generation Episode "Relics". This was a lot of fun trying to make it look exactly right. Special thanks to Paul Sibbald, who did a dead on William Conrad. Hope everyone enjoys this, it's probably the most fun I've had in while. 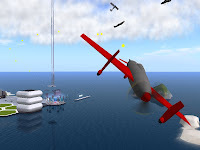 Plus I made a couple of tweaks in this one...."
If you have Second Life Aviation links for my new weekly blog post Virtual Aviation Week in Review, please let me know via email [zoeconnolly (at) gmail (dot) com. Aviation links may be blog posts, photographs, videos, etc....Just about anything related to SL Aviation. ".... As a commercial helicopter pilot, I get my fair share of hangar flying. I meet some interesting characters who eagerly take time away from whatever they are doing to tell me about the hours they have logged in their Otter or the intricacies of their engine overhaul. I mean, I thought that women liked to talk incessantly, but these men have the gift of gab on the tarmac. Not until I became a pilot myself, did I understand that men are from Mars and women are still grounded on this very Earth. Recently, I’ve had the opportunity to interview and visit with a number of female aviators who, quite honestly, I was glad to chat with for an hour. After speaking with this group of women, who range from a student pilot to an F-16 pilot and Major in the Air Force, I must say that they are nothing of a minority. They are the elite. They love what they do. They are passionate, and I absolutely respect the careers that each has developed in a challenging industry. They are, simply put, the cream of the crop in our small aviation world. Now, the more time I spend with fellow male pilots talking turbo-chargers and crosswind landings, the less interested in their stories I become. According to the Federal Aviation Administration, of the almost 700,000 active pilots in the United States, less than 6 percent are women. Slightly more than 2 percent are ATP rated. Furthermore, women account for only 2.13 percent of the more than 540,000 non-pilot aviation jobs in the country. There is no denying, by these numbers, that we work in a male-dominated industry. However, since Harriet Quimby became the first female to earn her private license in 1911, women have had a significant impact on the history and development of aviation. Dating back to 1910, when Blanche Scott commandeered a plane that unexpectedly took flight while taxiing, women have cemented their participation in the discipline. In November 1929, at Curtis Field on Long Island, 117 American female pilots gathered to mutually support advancement in aviation. During that gathering, the 99’s were born. Today, with more than 5,500 female members from 35-plus countries, the 99’s are one of the most influential organizations of licensed pilots. 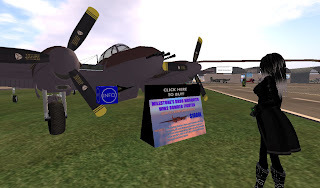 Due to their efforts, and other organizations like Aviation for Women, even the U.S. Air Force now boasts that 20 percent of its pilots and staff are women...."
Karl Reisman of Tumansky Heavy Industries, wrote a blog post about texturing in SL. The object is a WW2 Era British Spitfire, but the post should be of interest to builders across the grid and not just those of us in the aviation community. Karl wrote: "Well in truth you can't, because professional 3D tools allow you to edit UV maps, and assign texture coordinates to individual frames.. However that issue aside, you can come to a professional level if you approach your link sets as a single object, and the maps in a consistent layers based method. First build the object as you see fit. This is an example of a 3 view plan. This one was found on the web, not only is it useful for building, but it's also useful for placing details on the textures after you build the object in prims. I would suggest highly that you build to a plan, Even if it's a fictional draw the front side and top views of the item to keep control of the project. There are plenty of sites that have quality blueprints of cars, tanks, aircraft, and buildings that you could use for your project. But sometimes it's fun to roll your own. Just make sure the design is solid and consistent between the front side and top views, or you will go crazy. once the prims are arraigned. Collecting reference is necessary for a successful historical replica. 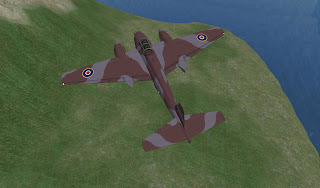 (This is "Blue Peter" , from the battle of Britain Memorial Flight and the "model for this project.) For a fictional or fantasy project, making or collecting a lot of concept art serves the same function. If you are building a historical object its very important to find as much reference as you can and duplicate the look from the reference without copying it exactly. Exact coying is considered plagiarism, and is frowned on, as well as being a reason for having the item deleted and your SL account locked. 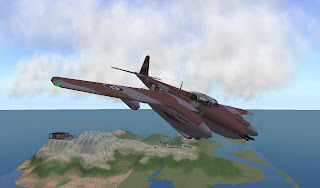 The quality Aircraft makers on SL make their own textures...."
SLAMCentralStudios wrote: "BSG47 recently moved on to a physics-based combat system called VICE, which left the majority of pilots completely in the dark as to how to fight. This video was created from an IN-CHARACTER standpoint to rationalize and explain the changes, and teach old and new pilots alike how to adjust...."
Thanks to Hamlet Au for the tip on this video. 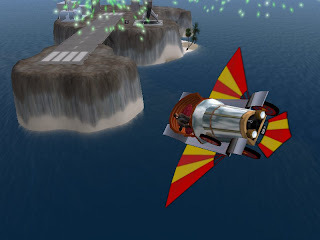 The Classic "Powers of Ten"
Pilots of the Extropia Defense Force and Royal Caledon Air Force engage in a dogfight furball over several Extropia sims. SL Builder Josh Noonan's Lockheed Electra 10E, Amelia Earhart's last airplane. Amelia flew her plane on her final flight. Her ill-fated world tour in 1937.
aylmer666 wrote: "Joke open for a Local News station in Fairbanks, Alaska, which unfortunately never aired. I felt Local news needed a sense of humor, but what do I know?...." illconprods wrote: "What would happen if you took an episode of Gerry Anderson's classic sci-fi series Space:1999 and treated it like a silent movie? Well, maybe something like this. Produced by us (Ill-Conceived Productions) for a Space:1999 convention in 2000, and later included as a bonus feature on the excellent DVD "Space:1999 and UFO - The Documentaries" by Fanderson, the official Gerry Anderson Appreciation Society...."
Bonus Video from hinesriley who wrote: "A LightWave 3D Rendering of Eagle One lifting off of Moonbase Alpha. I created Alpha Moonbase (Still under construction) from scratch. Eagle Model courtesy of James Murphy." elektricc wrote: "It's a mix between the great animotion of Andy Huang`s dollface and a new Song of VNV Nations CD Judgement. Even if it`s not a official Version it looks like it belong together...greetings from a fan." 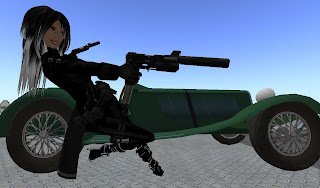 My new Ning Group: "Virtual Girls with Guns"
Luckily for those of us in SL, our air disasters are not nearly as serious as Amelia's 1937 World Flight disappearance. We'll always be able to relog and re-rez another Electra. For decades, controversy rages over whether Amelia was as good a pilot as the media portrayed her to be. One thing is certain. She was one of many women who opened the door to aviation for women in her time and in years to come. She has inspired men and women of all ages, and may also be history's favorite missing persons case. 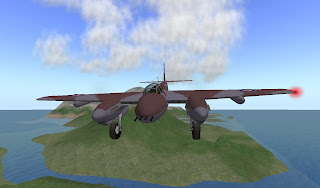 Here are a few photographs of the de Havilland Mosquito, built in SL and under flight tests by Bancos Milestone. 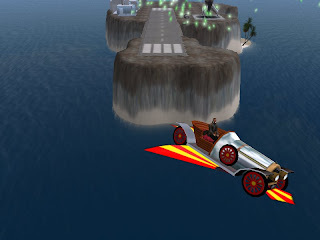 It was just released for public purchase at this SLurl. For a long time it was one sim and and not the greatest location for long term flying. That's all changed! BALSA INC AVEOUSA has partnered with developer Cindy Bolero. 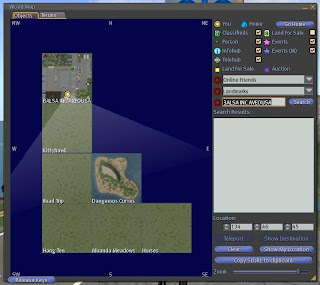 The area is now 7 sims worth of aviation-friendly heaven including BALSA INC AVEOUSA, Kittyhawk, Road Trip, Dangerous Curves, Hang Ten, Miranda Meadows, and Horses. I flew over the area last night and it *was* a little rough and laggy in spots. But I'm sure this will change as all the bugs are worked out. Also....the plan is to expand in phases. This being phase one. This is where I rez after I login to SL. 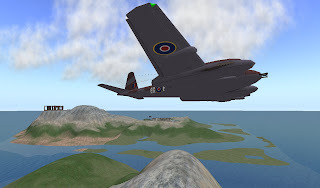 My home turf is Caledon where I have a skybox above the Aerodrome. What do you see when you first rez inworld? Phin here, filling-in for Zoe who was away most of the weekend. I organized the EDF/RCAF Dogfight on Saturday and took a few photos. These 5 pics are representative of the day. I managed to stay in the air longer than usual, concentrating on defensive maneuvers rather than attacks, when Cornelius flying his "Fine Four-Fendered Friend" took several shots at me and down I went, almost landing on Vidal Tripsa. Conveniently, I was 2 meters from the Tiki-Bar and decided to stay. 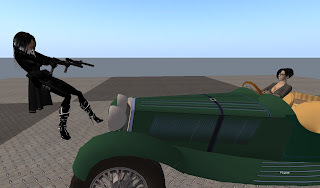 I took several photographs during and after the video-capture for my test machinima. Once I was done, I noticed Phin was online and promptly dragged him over to help me. He made a great Girl-with-Gun in his female form. Thanks, bro! 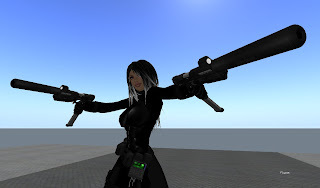 While working on ideas for a spy machinima, I did this test shot with a gun pose. 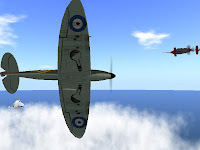 Vidal Tripsa writes: "Pilots from the Extropia Defense Force and Royal Caledon Air Force take to Extropia's skies under the lead of Cdr. Phineas Messmer and Cdr. Vidal "Trip" Tripsa. I filmed this starting from take-off, some cockpit footage that kept rolling until I was shot down, then some ground footage as I sought refuge on the island resort of Blood & Thunder, at Sen'Jin." Attention EDF and RCAF pilots! We'll meet at Skies of Tomorrow 9:00 AM SL Time. I'll lead on Saturday, ACM Sin Trenton leads us on Sunday. Sin and I have discussed new rules for our organized dogfights. These rules are approved by Marshal Zoe Connolly. Worry-not pilots! Your dogfights are the following weekend of Saturday the 16th and Sunday the 17th. More details on the RCAF Ning and group notices next week. The Prisonbear - Revival. A spoof of The Prisoner with toys. THE PRISONER, PATRICK MCGOOHAN SPEAKS Part one. THE PRISONER, PATRICK MCGOOHAN SPEAKS Part two. THE PRISONER, Well-come the start. "...In 1983, a U.S. Air Force English dictionary defined fur ball as "a confused dogfight full of swarming airplanes." The expression combines the fighting-animal image of flying fur with the eventful, sometimes charitable, occasionally frenetic, nature of a ball..."
With Z on vacation (with Michael Moore and Madonna) and the weekend looming with 14 hours of RL telecommuting work from home I decided to setup a Saturday Air Battle for pilots from the Extropia Defense Force and the Royal Caledon Air Force. And since I couldn't put much thought into it I took the lazy man's way out and just said, "Yeah yeah fly whatever you want and shoot everyone." No teams or themes. 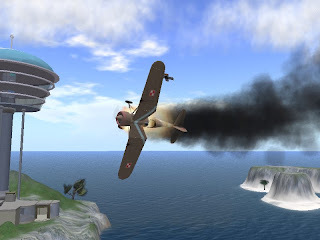 Ugh, I really need to get going and organize that EDF/RCAF Air Combat Tournament. I have a few more photos I'll post as soon as possible. Below is a snapshot of your intrepid pipe-smoking reporter, faithfully taking photographs of the battle swarm from a safe distance. Pilots of the RCAF and EDF will meet at the Skies of Tomorrow sim in Extropia on Saturday 02 August 2008 at 9:00 AM SLT for dogfight. We'll have air combat for approximately 45 minutes. 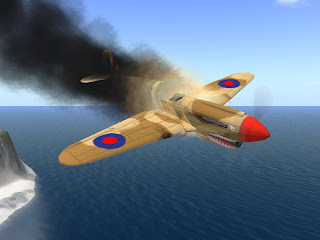 Our theme is : "Fly Your Favorite"
As always, one-on-one dogfights are welcome in Extropia and select void-sim duchies in Caledon.